WooCommerce store owners are always on the hunt for new ways to sell more. In many cases, the solution is as simple as adding a quick WooCommerce form or WooCommerce bulk order form to your website, using a WooCommerce order form plugin. Order forms allow customers to view and compare a longer list of products than the traditional WooCommerce layout. For lots of stores, an order form layout aligns better with how customers browse and buy products – encouraging more sales by enabling them to shop quickly and efficiently. WooCommerce Product Table is a popular plugin for creating a quick order form. In fact, people keep telling me it’s the best WooCommerce order form plugin around! We’ve built a quick order form demo so you can see how it works – go ahead and have a play. Add a quick and easy order form to your site today! Of course, an order form layout isn’t for everyone. In this post we’ll help you choose between using a WooCommerce order form plugin and the standard WooCommerce shop layout, so you can rest assured you’re creating the ideal product layout for your store. Once you’ve learned all about WC order forms, I’ll provide step-by-step instructions plus a video tutorial on exactly how to set it up. What is a WooCommerce order form or WooCommerce bulk order form? By default, Woo displays e-commerce products in a standard format, with each product occupying a relatively large amount of space. WooCommerce order form created using Product Table. An order form plugin lets you list many more products on a single page than you could in the default WooCommerce store layout. And, instead of clicking through to the single product page, customers can select variations, specify a quantity and add their chosen items to the cart – all directly from the WooCommerce order form. Both the traditional category layout and order form view use the Woo cart and checkout. Once a customer has chosen their products, the process for placing an order is identical. The real difference is how the products are presented in the first place. This is a key part of the buying process: it’s the point when customers are exploring your products and making buying decisions. The layout has a big impact on your sales and conversion rates, so it’s vital to choose the right layout for your products. Using the product table, you’ll fit twice as many products into the same amount of space. Because of the compact layout, it’s also possible to fit in plenty of extra features, including filter dropdowns, a search box, sorting, and the ability to select quantities and variations. This is why we often refer to it as a WooCommerce bulk order form – because it’s so much easier to order higher quantities. What sort of websites need a WooCommerce order form plugin? While the standard WooCommerce shop format is great for some stores, there are many cases when an order form gives customers a better buying experience. A WooCommerce order form plugin is ideally suited to stores where customers don’t want to hang around browsing, but instead want to quickly choose from a list of products. Add several products at once with a straightforward WooCommerce bulk order form. Trade customers typically make regular orders of products they’re already familiar with. A compact wholesale order form lets them quickly select multiple products from a table and instantly add to cart. This is more efficient for wholesale users than a more traditional WooCommerce product layout, which is too visual and spaced out. It’s ideal for bulk wholesale buying. You can use it with other plugins such as WooCommerce Password Protected Categories to hide a whole WooCommerce store and make your products private. You can even have a central WooCommerce customer login page for your wholesale store. A lot of our WooCommerce Product Table plugin users have HUGE e-commerce stores with thousands of products. A WooCommerce quick order form plugin is a good way to list large numbers of products in a directory structure. For example, one website uses WooCommerce Product Table to display thousands of ball bearings for sale. Customers can use the filters to find the type of ball bearing they require based on product attributes such as size and color. They can then tick the products they want, add to cart and buy online. This would be a cumbersome process using the traditional WooCommerce shop layout. Not to mention that large pictures of ball bearings aren’t necessary! 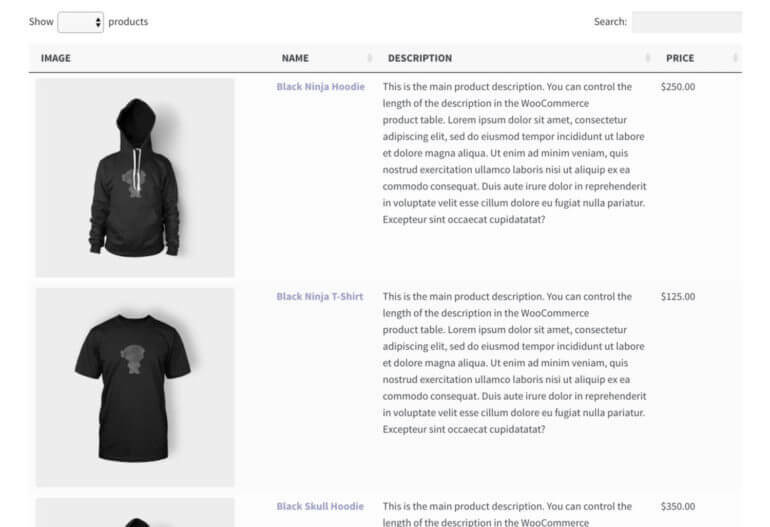 Check out our tutorial on how to create a WooCommerce product catalogue. A WooCommerce order form replicates a physical menu much more closely than the traditional WooCommerce layout. Plus, an order form layout is how people expect to order their fast food. So any food delivery website would benefit from displaying their menu in a table layout. Check out our tutorial and video on how to create an online food ordering system for a restaurant. Similar to a wholesale order form, a WooCommerce bulk order form is useful for ordering large quantities of products. If a customer is buying products in bulk, they won’t want to browse through the standard WC layout. A product table is perfect as a bulk order form because they can quickly order as many products as they like. Lots of WooCommerce websites let customers choose multiple items from a list to build a box, create their own pizza, build a luxury hamper, or similar. 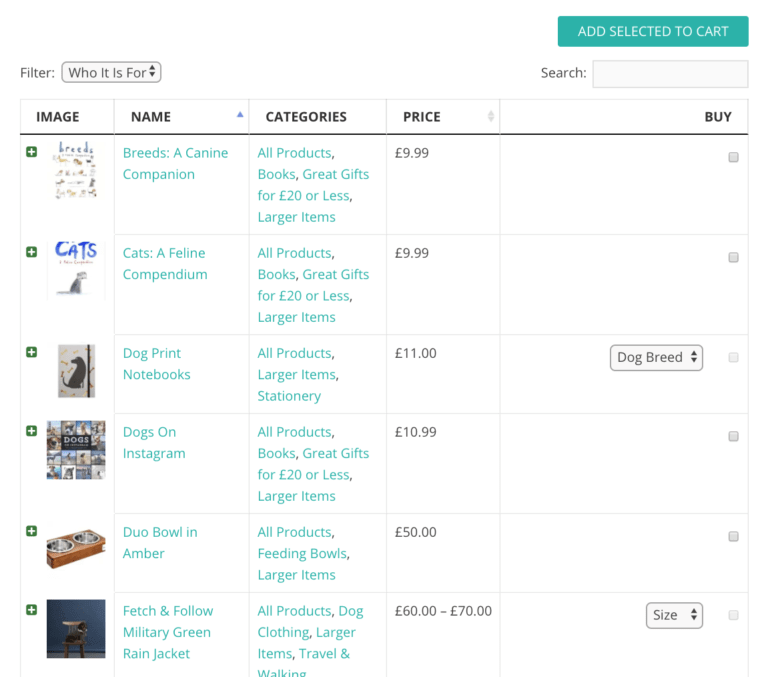 Customers can select items from a list and add them all to a cart with a single click. A WooCommerce order form is ideal for this ‘build a product’ format. Try it for yourself! Visit our WooCommerce order form demo. Which WooCommerce stores don’t need a quick order form? As you can see, a WooCommerce order form plugin is the right choice for lots of stores, but it isn’t for everyone. Does your store only have a few products? Do you sell highly visual products that will benefit from big images or multiple images? Do customers need to spend a long time reading detailed information about your products before deciding to buy? As an example, imagine you own an online boutique clothing store. Think about how your customers would use your store. Big images will definitely play a crucial role in encouraging sales. Your customers will also be happy to take their time browsing items and reading detailed product information. They may then go on to make a considered purchase of one, two, or perhaps a few items. But ultimately, deciding on the right layout to use comes down to which one best suits your particular customers. 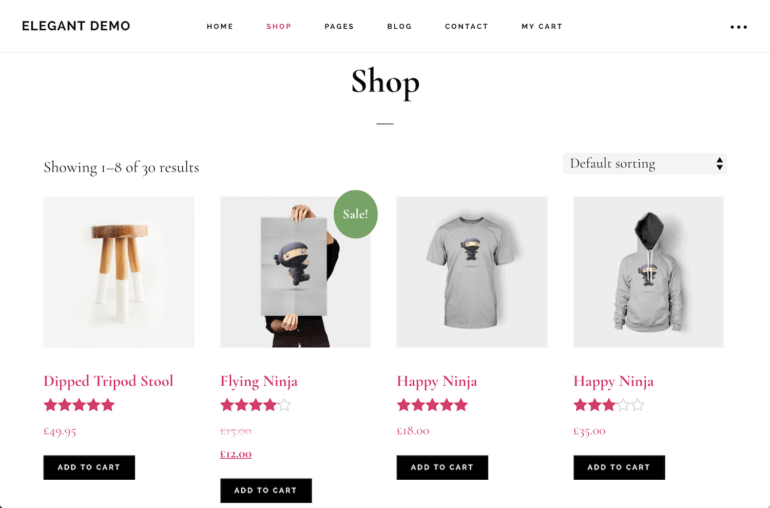 With smaller purchase quantities and less need for quick purchases, your imaginary boutique clothing store is likely to benefit from the highly visual layout characteristic of the standard WooCommerce shop format. What features will my WooCommerce order form have? If you do decide a WooCommerce order form plugin is the right fit for your store, you’ll be happy to know WooCommerce Product Table comes with all the features you need to create professional online order forms. It’s also super easy and fast to set up on any WooCommerce website. The WooCommerce Product Table plugin lets you control which columns appear in your order form table. You can display various data about your products including SKU, ID, name, description, short description, date, categories, tags, image, reviews, stock, weight, dimensions, price and Add to Cart button. The plugin supports product attributes and custom fields as separate columns in the table, e.g. size or color. You can choose whether the Add to Cart column includes product variations and quantity selector, or whether you want customers to click through to the single product page to view the variations. And if you’re using the official Product Add-Ons plugin, then the add-ons will appear in the WooCommerce order form too. The WooCommerce order form can include filter dropdowns above or alongside the table. 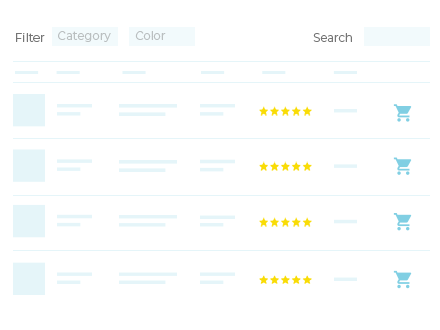 This lets customers filter by category, tag or attribute. You can either include all possible filters or choose specific ones to appear. If you add your WooCommerce form to a page with a left or right sidebar, then you can use the WooCommerce Cart widget to show the contents of the cart directly on the page. When a customer adds items to the cart from the order form, the cart widget will update instantly. They can see subtotals and order totals and click through straight to the checkout. Your WooCommerce order form can contain various columns of information about your products. However, you may want to display extra information that won’t fit in the order form layout. Or you may want to sell product variations or other options without cluttering up the order form page. You can solve this dilemma by using WooCommerce Product Table with the WooCommerce Quick View Pro plugin. This adds quick view buttons or links, which open extra product information and purchase options in a user-friendly lightbox window. It’s a great way to show extra information without taking customers away from the WooCommerce order form page. By default, customers can click on a product title or image in the order form to view a separate page for each product. Most WooCommerce order forms don’t need this feature. You can disable these links if needed so that the only way to view a product is on the order form page – especially if you’re using quick view instead. You can choose how the products on the order form are sorted by default. Customers can also sort the products by clicking on a column header. By default, the plugin lists all your products on the WooCommerce order form. If you don’t want this then you can include specific products by their ID, categories or tags. You can also exclude products by ID or category. The plugin comes with a lazy load option to speed up the order form load time for WooCommerce stores with many products. This uses Ajax to load products one page at a time, so if you have thousands of products then this makes a big difference. Control your order form column widths, image size etc. WooCommerce Product Table will automatically choose an appropriate size for each column and your product images (if you’re displaying them). You can override these to control the column widths, responsive priorities, description length, image size etc. You can add multiple product tables per page. To create a multi-section order form, simply add a subheading for each section followed by a table displaying products from a specific category. The whole point of a one-page WooCommerce order form is to make the buying process quick and easy. With this in mind, you might want to skip the cart completely and take people straight to the checkout when they add products to the cart. This is very easy to do, with full instructions in the knowledge base. Your WooCommerce order form will make more sales if you provide a choice of payment methods. Some customers like to pay online via PayPal, and some prefer credit or debit card. Others want to pay later via invoice. WooCommerce lets you add as many payment methods as you like. This includes PayPal, credit card (via a payment processor such as Stripe). It also includes offline payment options such as Cash on Delivery or Cheque. Use Payments section of the official WooCommerce documentation to set them up. It’s not immediately obvious how to set up payment by invoice. However, it’s actually really easy. Just choose ‘Cash on delivery’, ‘Cheque’ or ‘BACS’, rename it to ‘Pay By Invoice’ in the WooCommerce checkout settings. Change the wording to instruct customers to add their invoice details. Check out our top 10 tips on using WooCommerce forms to improve your conversion rate optimization. To start, you need a WordPress website with WooCommerce set up and some products added. Get WooCommerce Product Table and install it via Plugins > Add New. Get your license key from the confirmation email and enter it into WooCommerce > Settings > Products > Product tables. Create a new page which you will use for your WooCommerce order form. If you prefer, you can also add the order form to a post, text widget, or directly to your shop and category page template file. Add any content that you like to the page. For example, you can add text or other content above and below the order form. You can also add subheadings (e.g. one for each category) and insert a different order form after each one. Publish the page and view it. On your WooCommerce order form page, you’ll see all your products listed in a neat table layout. Tweak the settings and use the shortcode options to configure your order form in whichever way you like. This is also the time to add any further plugins to enhance your order forms, such as WooCommerce Quick View Pro. Since publishing this article, some of our customers have asked about how to create a printable order form. The idea of this is that customers can print the order form on paper and fill it in manually. They can then post it to place the order the old-fashioned way. In response, we’ve created a separate tutorial on how to create a printable WooCommerce order form. How your customers want to shop should dictate your store’s product layout. The default WooCommerce shop layout works for customers who are happy to take their time browsing images and reading descriptions. But, when your customers need to buy multiple items quickly, a WooCommerce order form plugin is a much better solution. We’d love to see your WooCommerce form – drop us a line or share your website in the comments below. We might even link to it from the WooCommerce Product Table showcase! We are currently building a WordPress/woocommerce website to sell our wholesale products to regular business customers. We have a number of weekly customers that may have used 20 of our products during any one year. Each week they may only order 5 of their 20 products. Each week it will be a different 5 products. When our returning customers log in, what we want is an order form that consists of all the previous products they have purchased. From here they could just add the quantity required and order. If they want an item they have never purchased before, they can opt to continue shopping. This would help simplify the shopping experience for regular customers and encourage them to use our website more, rather than pick up the phone to us at head office. Do any of your plugins have the capability to do this for me? Hi Chris, unfortunately none of our plugins offer this functionality. They don't link in with a customers' previous purchases in any way. I have seen WooCommerce re-order plugins that add Order Again buttons to the customer account pages where it lists their previous orders - that's the closest I have come across. 1. My catering is set up where people select the number of people that they are trying to feed, and then they select one main dish and three sides. People can order extra sides for a flat fee per person. Right now I have the form set up on the dev site like this: https://77.104.161.75/~yellowbe/catering/?v=402f03a963ba (click the order form tab). Is there a way to make it more sequential or deploy logic so that they buttons below don't say add to cart, but rather select one or select three? And then once they select it greys the others out? 2. My next question, is there a way on the check out form to add a comment box so that people can add specific directions? I hope these questions made sense. I read through the FAQ and I didn't see the answers. I apologize if they are there and I just missed them. Hi Mike, thanks for your questions. Your restaurant catering order form is looking fantastic! I see that you've already renamed the add to cart column to add clear instructions, which is great. For the categories where you want people to select more than one product, you can use the multi-select add to cart option to add checkboxes instead of having an add to cart button for each product. You can use the Quantities & Units plugin to prevent people from buying more than the maximum number of items from each category (e.g. if you have a 'sides' category then you can use it to prevent them from ordering more than 3 sides). 2. You can do this using the free WooCommerce Checkout Manager plugin. Not sure if you've seen that we also have a detailed tutorial on how to create a restaurant ordering system using the same plugin? This has a lot of extra info that would be useful for you. Can you have multiple layouts (e.g. for different roles)? Does it support most payment gateways (specifically SagePay, Cardsave, Invoice Payments)? Does it support dynamic price changes (e.g. volume discounts) and role based pricing? Can it be used to create order for customers (e.g. like a telephone POS system)? We are an agency that has several site we'd use this on. Hi Mick, thanks for your questions. 1. Do you mean that you want to create multiple tables, each one different? Yes, you can do this. Or if you mean that you want to use the default WooCommerce layout for some products/categories and the product table layout for others, then you can do this by using your normal category pages for the ones where you require the original layout; and add the product table shortcode provided by our plugin to a page for the products that you want to list in a product table. Does that make sense? 2. The payment side of things comes from WooCommerce itself rather than our WooCommerce Product Table plugin. WooCommerce has several built-in payment methods such as PayPal and invoice, and there are official WooCommerce.com extensions that you can install to add other gateways such as SagePay. 3. WooCommerce Product Table works with several volume discount and role based pricing plugins. Please see our list of compatible plugins at https://barn2.co.uk/kb/product-table-plugin-compatibility/. 4. Not sure exactly what you mean by this - maybe send more information to us at support@barn2.co.uk. Do you mean that you'd like to take orders over the phone? You can do this using the instructions provided in this tutorial. This is slightly different from your use case, but the overall method is the same. 5. We offer a choice of licenses including an Agency license. If you need to use it on more than 20 sites, please get in touch and we can agree further discounts. I like the look/feel of your product form. I will be selling cuts of beef, lamb, pork and chicken. I'd like the system to calculate the cost of the cut after I input the price/lb and weight (lbs). Can your order-form-plugin do that? Hi Julie, WooCommerce Product Table can only calculate the price of each product based on the quantity. So you can have a price for each product, plus a quantity picker. Some of our customers rename the price column to something like 'Price Per KG' and use these built-in features to sell products by the kilogram. If you need more complex logic then I recommend checking out the Product Add-Ons plugin, which we have fully integrated with. This has custom price multiplier add-on options which you can add to each product, which will give you more flexibility. I am setting up a store that allows teams to order custom jerseys. They will have their own designs and I will need a bulk ordering system that they choose their jersey, They then choose how many of each size available they want and after that, they will be allowed to enter a name attribute, number attribute, team name attribute for each specific size. This will speed ordering for teams and organizations with 100's of players. Does your product support this? Hi Adam, I recommend adding each jersey as a product and list them in a table using our WooCommerce Product Table plugin. You can then use the Product Add-Ons plugin to add various options for size, name, number, team name, etc. This is better than product variations because you can add things like text boxes and checkboxes, whereas variations only come with basic dropdowns. If that's not flexible enough then you may wish to look at something like composite products or product bundles, which add extra options. You can read about the different options for creating these sorts of products in this article. Please note that composite products, bundled products etc. can't be ordered from directly within the product table so if you go down this route then it would be best to continue listing your jerseys in a table, but instead of having an add to cart column, you would use our WooCommerce Quick View Pro plugin to add a quick view column (which you can rename to anything you like). Customers can click on the quick view buttons to open up the options in a lightbox, which is the best place for them to build their composite products, bundles, etc. You may also want our WooCommerce Protected Categories plugin to create a separate hidden category for each team's products, since you are selling custom jerseys that are different for each team/customer. Your requirements sound quite complex so if you have any further questions, feel free to reach out to us at support@barn2.co.uk.